Double Choc Chip Cookies equals double the enjoyment. So it’s been raining here the last 2 days. I mean really raining. I mean, this is Perth, Australia and it’s the middle of summer!!! Last week we had temperatures above 40C and now it’s raining. What the? It’s cool too. I’m not complaining. Not one little bit, because I love the rain. I love winter. I love being wrapped up in a blanket on the sofa. This weather makes me happy but seriously, it’s the middle of summer! Craziness. Well, weather like this calls for one thing (as if I need an excuse). Chocolate, or maybe choc chip something. How to decide? I know, how about Double Choc Chip Cookies. I love choc chip insert-vessel-here, so double choc chip to me sounds like heaven. I’ve made plenty of over the years and my very favourites are these Salted Chunky Chocolate Chip Cookies (salt optional). I grew up thinking Choc Chip Ice cream was perfection and why anyone would choose a different flavour was beyond me. And how can you go past my Choc Chip Cookie Cheesecake Slice? Nom, nom, nom. 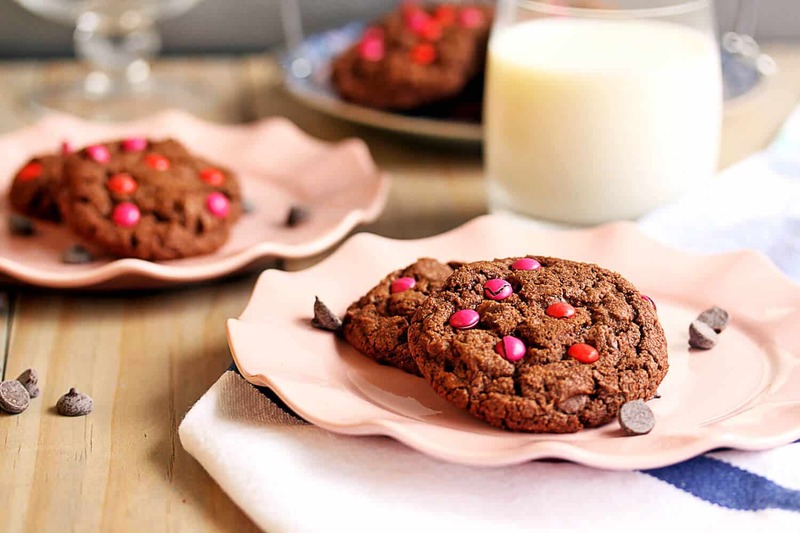 So these Double Choc Chip Cookies are so decadent and yummy. They should really be called TRIPLE choc chip because they have 2 different types of choc chips in them as well as cocoa in the dough. 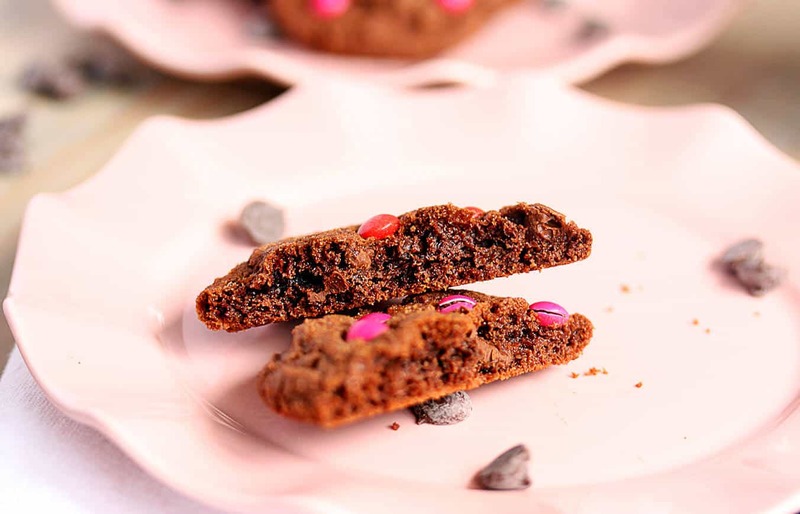 I added the pink and red choc chips on top to give a Valentines Day feel to them and look how they cracked, just like the cookies. So cute. But under that cutesy exterior is a very grown-up cookie indeed. Think dark chocolate chips, dark brown sugar and dutch processed cocoa, people. These are the perfect combo of crispy outside and a slight chew in the middle and so more-ish you won’t be able to stop at one. Lucky the batch makes 24 then, right? 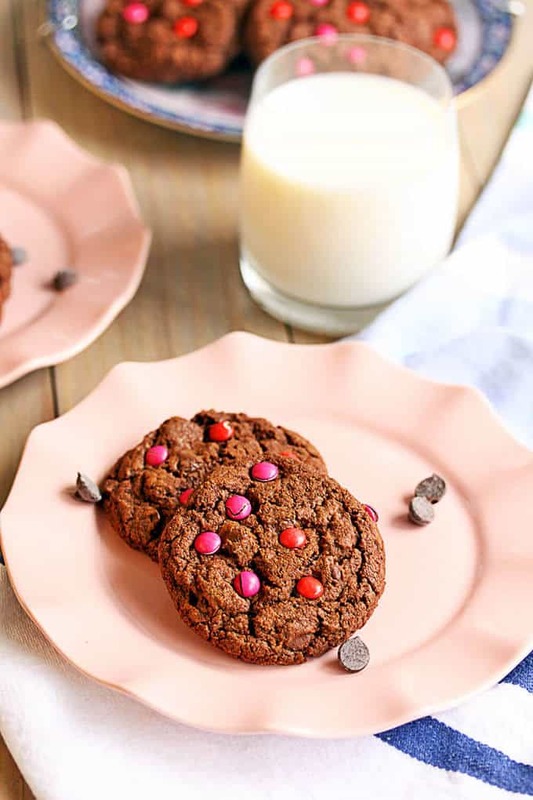 Want more chocolate chip recipes? Preheat the oven to 180C (160C fan forced) / 350F. Line 4 baking trays with baking paper. Sift together the flours, cocoa, baking soda, baking powder and salt. Give them a good mix around to combine. Cream together the butter and both sugars until very light and fluffy. (this can take a few minutes and make sure to scrape down the sides as necessary). Add the egg and vanilla and beat well. With the mixer on low, add the dry ingredients in 3 lots, each time mixing until just combined. Don’t overmix. Fold in the chocolate chips. Bake for 18-20 minutes until edges look dry and starting to crisp. Transfer to a wire rack to cool a little and serve them just a little warm or at room temperature. I love chocolate cookies! And M&Ms make them even better! 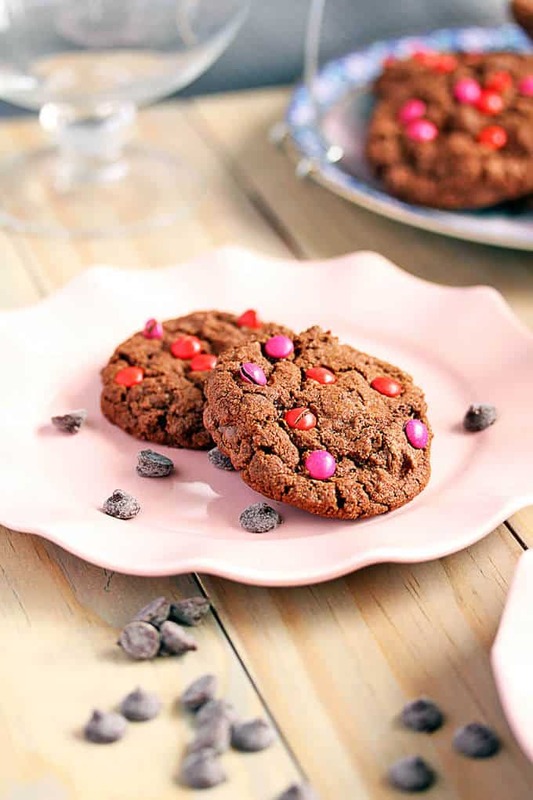 I like this so much.It looks like ginger biscuit cookies which is my favourite.But the taste might be different.Having M&Ms make it even better.LOVE anything brown. Hello Harleen, yes they are definitely different to ginger biscuits 🙂 Very delicious though. Thanks for stopping by. Which ingredient would be best subsitute for eggs in cookies because i want to make all varities of eggless cookies.